Centenarians often have low levels of triglycerides and are lean. Snell dwarf mice have modeled nicely how a beneficial mutation in preferential metabolism can slow the aging process by minimizing the oxidative damage from metabolizing glucose by favoring fat metabolism instead. 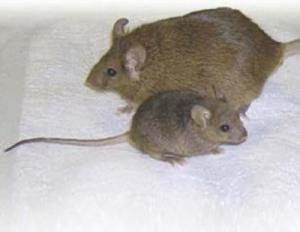 increased longevity of Snell dwarf mice (bottom). ScienceDaily (Nov. 23, 2007) — Both humans and mice that manage to live to a ripe, old age show a clear change in their glucose metabolism, but it's unclear whether this change alone can increase lifespan. Using a mouse model of longevity, Terry Combs and colleagues report that changes in metabolism can indeed increase longevity. They demonstrated that long-lived Snell dwarf mice burn less glucose and more fatty acids during periods of fasting, and as a result produce fewer free radicals. The key to this switch may be adiponectin, a hormone produced by fat cells that helps lower glucose production and stimulates cells to use fat for energy instead. The researchers found that Snell mice had three times as much adiponectin in their blood as control mice; Snell mice also had fewer triglycerides in their cells, indicative of higher fat metabolism. The benefit of burning fats instead of glucose for energy is that it produces fewer oxygen radicals which can damage cells and exacerbate the effects of aging. Confirming this, Combs and colleagues found far less free radical damage, measured as the frequency of a chemical modification on protein known as carbonyl groups, in Snell mice than controls. I'm wondering if some of the results were confounded by the size differential, i.e., all things equal, smaller animals within most any species tend to live longer than their larger counterparts. Without bothering to delve into the details of the original research paper myself, I'm guessing they're competent enough to correct for body size when evaluating the disparity in longevity. Note how in true media fashion, the title is accurate but somewhat misleading in regard to the important bit here, which is that any preferential reduction in glucose metabolism in favor of fatty-acid energy sourcing could minimize oxidative stress--no favorable mutations in adiponectin production required.